We've looked at the average cost of cat insurance in the UK, and some of the factors that can influence it. Get a quote for your cat with Bought By Many's unique pet insurance policies, or check out our guide to the best pet insurance for cats. What is the average cost of pet insurance for a cat in the UK? The average annual premium for cat insurance in the UK will vary depending on your circumstances but 44% of people paid £100 or less between the second quarter of 2016 and the first quarter of 2017, which equates to £8.33 a month, according to data from Consumer Intelligence. We looked at data from the last 12 months from our pet insurance policies and found our cat insurance customers paid £150 a year on average. That may reflect the level of cover our policies offer; our Complete policy is the most comprehensive pet insurance product on the market. The cost of cat insurance is usually cheaper than the cost of dog insurance because vet fees for cats are generally cheaper than they are for dogs. Also, older cats are less expensive to insure than older dogs and cats do not need public liability insurance. As an owner you are not responsible for any damage your cat does; cats are regarded by the law as 'free spirits'. Still, the price of your insurance usually increases as your cat gets older, regardless of whether you make a claim. Premiums for older cats can be more expensive than for a cat aged one or two. To try and prevent this, we've created a Fixed For Life policy that will never increase in price, whether you claim or not. It is only available for kittens and puppies under the age of two. Join our Fixed For Life group to get a quote for your kitten. Accident-only cat insurance is the cheapest cat insurance policy. This often costs between £3 and £5 a month and can cover vet fees if your cat needs attention due to an accident. However, it won't pay out for anything else, including illnesses. Time-limited cat insurance is usually the second cheapest pet insurance policy. This basic cat insurance policy can cover your pet if it needs treatment for a short-term illness. It tends to cover each condition for 12 months up to a certain monetary limit. This means if your cat's condition reoccurs, it won't be covered. Time-limited cat insurance policies usually cost between £6 and £15 per month. Per condition cat insurance limits how much you can claim for each medical condition that affects your cat. There is no time limit on this claim, however. This policy usually costs more than both time-limited and accident-only policies, but less than lifetime cover. Lifetime cat insurance is usually the most expensive cat insurance policy. However, it also affords the most comprehensive cover. It covers most vet fees your cat needs during its lifetime, up to a specific monetary limit. This policy usually costs £100 per year or more. Bear in mind that cat insurance policies don't necessarily only cover vet fees. They can also help with costs if your cat is lost or stolen, and can sometimes even pay for alternative treatment costs such as homoeopathy. Bought By Many has launched several products unique to the pet insurance market, including a policy that offers money back for every year you don't claim and another that can provide cover for some pre-existing conditions. To find out more, join our pet insurance group. Where you live will have a big effect on cat insurance costs, as the price of vet treatment will cost different amounts depending on where you live in the country. In general, cat insurance will cost less if you live outside of London and the South East. Cities and other urban areas are likely to be more expensive than rural areas as vet fees tend to be higher. When getting quotes for our sister article, what does dog insurance cost?, we found that the most expensive place to insure your pet was London, and the least expensive the East Midlands. Other cheaper areas included the North West of England and Yorkshire & Humber. The age of your cat can also influence your pet insurance policy. Younger cats are likely to cost less to insure than an older cat. Some companies may even refuse to cover a cat if it is over the age of eight or nine, or you may have to pay a percentage of your claim on top of any excess costs. However, your cat's age won't influence the cost of your premium as much as it would if you owned a dog. Dog insurance can cost several times more for an older dog. Some may see the increase in prices for older cats as unfair, but insurance costs increase because the company is more likely to have to pay out for vet bills as the cat gets older. Not only will the cost of a newly-insured older cat be higher than a younger one, but as your cat gets older, insurance costs can increase on renewal. For this reason, some owners put money away into a savings account, which is known as 'self-insuring', rather than take out a policy. This means they have money to pay their vet fees if their pet gets sick. Finally, some cats may be cheaper to insure when they turn one than they are before the age of one. This is because there can be a higher risk of illness, and therefore of making a claim, in the cat's first year of life. Often the breed of cat you own will affect your premium price. This is because purebred cats can be more likely to develop illnesses due to having a less diverse gene pool. As well as this, different breeds will cost different amounts to insure as each is prone to its own ailments. Siamese cats, for instance, can be prone to kidney and respiratory diseases; Persian cats, are susceptible to progressive retinal atrophy (a disease that can cause blindness). For these reasons, moggies (occasionally spelled moggy), or mixed-breed cats, are usually cheaper to insure. Pet insurance companies will price their policies very differently. The top-end companies such as Petplan, John Lewis Finance and More Than offer some more comprehensive policies, with higher vet fees cover and extras such as dental treatment and cover for alternative therapies. Other pet insurance companies may not offer such comprehensive policies but may be cheaper. Pet insurance companies like Helpucover and Animal Friends will offer some cheaper policies that won't offer as much cover for those looking to buy a cheap policy. Bought By Many offers a cheaper pet insurance policy called Value. Value is a no-frills time limited policy that can offer basic cover for your pet at a reasonable price. But we also have the most comprehensive policy on the market - Complete. How can I make my cat insurance cheaper? 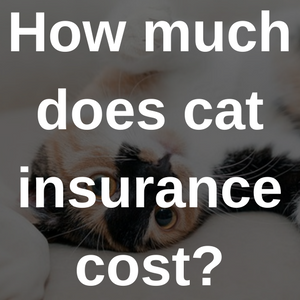 The easiest and fastest way to lower the cost of cat insurance is by increasing the price of your excess. Many pet insurance companies offer this option, though not all of them. Remember that the excess is what you will have to pay if you need to make a claim, so it should be set at a level that is affordable for you. On top of this, once your cat is older than eight or nine, you may have to pay a percentage of every claim on top of your policy excess. Lots of cat insurance companies will also offer a multi-pet discount that can bring costs down if you have more than one pet. Bought By Many offers a 15% multi pet insurance discount for cats on the same policy. Take a look at our article on the best multi-pet insurance discounts for more information. If you also have a dog, why not take a look at our article on the cost of dog insurance. We've written a guide to the the best pet insurance for cats.